What is Hello Pal Mirror? If you wish to practice chatting without disturbing anyone, the Hello Pal Mirror is the perfect chat mate; it will send everything you send it right back to you. Hello Pal Mirror will simply repeat what you send him, which is a great way to familiarize yourself with all the Hello Pal features. 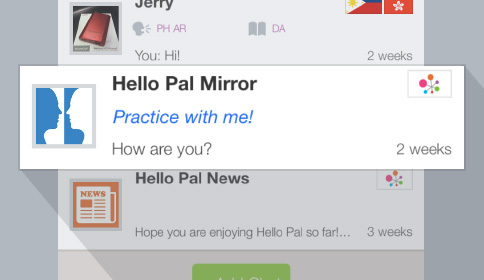 When you first sign in to your account, Hello Pal Mirror will automatically be added to your pal list. Tap on Hello Pal Mirror and practice away!